CARDINGTON — As an African-American attorney, Evva Kinney Heath established the legal status of women’s property rights in a test case in the District of Colombia. A Cardington native, Heath took up the cause during the course of her legal practice in the early 1900s. 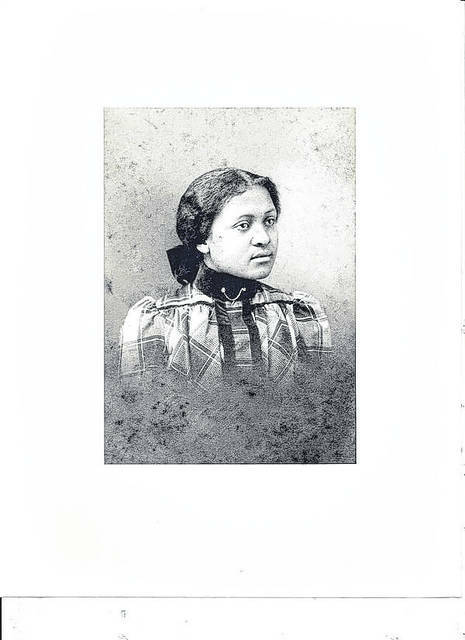 An 1897 graduate of Cardington High School and a 1904 law graduate from Howard University in Washington, D. C., Heath earned the respect of her peers and much of Washington, according to news clippings and her personal letters to her mother and other family members in Cardington. Born February 10, 1880 in Cardington, her interest in education was encouraged by her mother, Louisa, who had been widowed at the age of 26 with three small children. Evva’s father, David Kinney, (spelled Kenney in the early days),who was 85 years old when she was born, had married Louisa just 10 years before. He fathered a son and a daughter before Evva was born. She was two years old when her father died. In an era when very few youngsters went to school past the eighth grade, the three Kinney children all graduated from Cardington High School. Evva and her brother, John, graduated in the same class and their sister, Bessie, received her diploma one year later. Louisa Kinney supported her children by helping people in the community, through midwifery, caring for the sick and housekeeping. Evva took a teaching certificate test in West Virginia the summer of 1897 and upon passing it, she became a teacher of grade school students in two one-room schools in Bramwell, West Virginia. In another letter, she said her salary was $8 per week, $32 per term and $192 for six months. “I did not know when I sat on the stage the 28th of May at CHS, that today I would be commanding $32 per month,” she wrote. While teaching one year in Bramwell, she met Henry Heath, also a teacher. Returning to Columbus in 1898, she attended Parsons Community College taking business courses and continued a correspondence with Heath, whom she married Jan. 1, 1899. They both entered Howard University Law School, Washington D C where he attended classes at night, working during the day. Evva took employment with the U.S. Treasury Department while going to school. The only female in her class of 22, she received her diploma from Howard University on May 30, 1904, and was commissioned by President Theodore Roosevelt in 1906. “I don’t believe I ever spoke as well as I did on that occasion, everyone was spellbound and it set the city to talking,” she penned. Later, she was invited to speak at the Women’s National Convention in Washington which was attended by about 3,000 people. Her elocution talent was heard through readings given before leading literary societies in Washington. Practicing law there, she became known for her championing of women’s property rights.